How to make a gnome for the garden? New summer season is a great time to refresh the garden and the implementation of creative ideas. By the way, decorate garden original figures made of concrete and wood you can own. The new summer season it is appropriate to start with the decoration of your own area. With the help of experts may not be required. 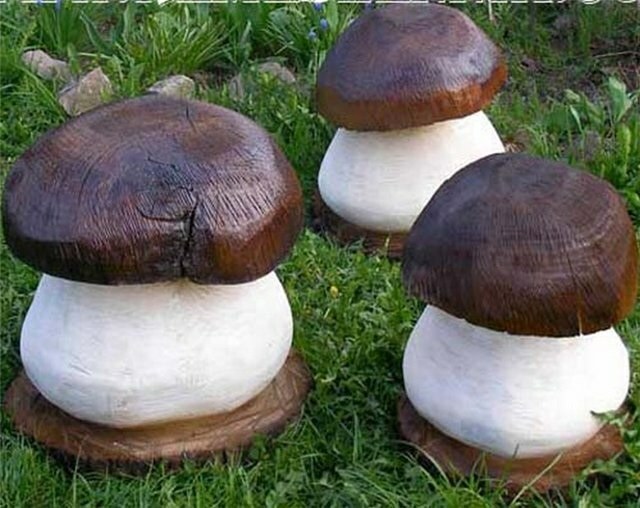 In order to save money and Express your personality, it is possible to make interesting figures and wood and concrete, which will decorate your garden. Perhaps the tree is the most popular and inexpensive material for creating garden sculptures. It is enough to choose the right log, snag or stump unusual forms, process them and get the original decorative figurine. For example, if there is a desire to make a figure of a Bunny, you need to stock up on jigsaw, nails, sandpaper, paint, varnish, plywood and common log. All this can be easily find in the garden. To start, cut off a part of the log at an angle of 45 degrees. Carefully Polish the surface of the workpiece and allow it to dry. Then cover it with paint or varnish. The ears and snout should be cut stencil specially selected jigsaws. Now draw on the face with eyes and mouth, and paint the rest of the details at its sole discretion. Ears and nose will have to attach the studs. Also it is possible to add some additional details. That's all. It remains only to install a wooden Bunny in your garden. How to create concrete garden figures? Garden sculptures made of concrete can easily become the center of your suburban area or used to decorate particular objects. A concrete structure can be given any shape or size easily. By the way, liquid the sculpted concrete is a very plastic substance. Concrete figure for garden can be done with your own hands. For this you will need certain materials. The solution will need to mix white glue, cement and water. From metal rebar and wire is assembled the skeleton of the future sculpture. Required attribute should be finished plastic or silicone form. To create a pattern on the surface of the figures will need: a chisel, sand paper and an awl. Also don't forget about purchasing a water-repellent primer for concrete and finishing materials. So, start the process by creating a frame, and then mix the grout. The consistency should be quite thick. This complete metal frame or fill the selected capacity. Available in the frame cavity also need to fill out so that the figure turned out to be relatively easy. Then, on the surface of the sculpture should draw a picture and you can send decor for drying. It needs to dry in shady side, otherwise possible occurrence of cracks on the sculpture. This forms a durable surface layer. After that, the shape of the figures can be changed with improvised means, if desired. After two or three days, cover the product with a primer and paint it to your liking.